Each of our breedings is carefully considered and we're proud of the quality of puppies we produce. As you can see from exploring this site, we are a small, non-profit hobby kennel. Our puppies are raised in our home and exposed to the noise, children and people of everyday life. 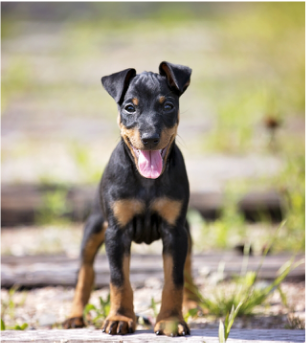 We sell our companion and performance puppies for $1,550, which includes a $50 deposit in the form of a donation to a breed-related charity of your choice (we recommend the Canadian Manchester Terrier Club). Inquiries regarding show puppies are welcome, however it should be noted that the wait for a show quality puppy may be long as we do not breed frequently and have a significant waiting list. All of our puppies are de-wormed, tattooed or microchipped for identification and vet checked with shots up-to-date when they leave. In accordance with Nova Scotia law, puppy owners also receive a vet-certified health certificate with their puppy. To ensure our puppies get the best possible start, we follow the Puppy Culture training program with our puppies from their first week of life until they leave our home and encourage puppy owners to continue this important foundation training. Please take note that while puppies are occasionally available, reservations should be made early. In order to help us find the right fit for you and your lifestyle, we ask anyone interested in a puppy to fill out our Puppy Application. We welcome questions about the breed our breeding program and invite those interested in Manchesters to contact us at any time. Visitors are always welcome, but please call or email ahead as we have hectic schedules! In the meantime, use the buttons below to learn more about dogs currently available as well as planned breedings.